Throughout the world, artisans tell stories through their textiles. Layer by layer, stitch by stitch, in many sizes, shapes and palettes, they depict daily life and their stories of how the world came to be. We’ve assembled an amazing array of these one-of-a-kind, high quality pieces. Latin American countries are prolific, but we’ve also found sources in Syria, South Africa and South East Asia. They are hard to come by. Our new website will make it easier for us to add new sources as we find them. 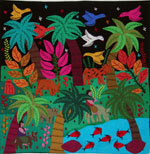 Arpilleras (pronounced "ar-pee-air-ahs") are appliqué story cloths of Latin America. A contemporary craft, the first ones were made by the Mothers of the Disappeared in Chile to tell their stories and support their families. Crossroads Trade carries Peruvian and Bolivian appliqué textiles. The Peruvian work comes from a women's coop in Lima, whose members left Andean villages, coming to the city to seek a better life. Their designs evoke markets, harvests, fiestas and tragedies of village life. The women work in a one-room brick building in their neighborhood. Our Bolivian applique textiles are the work of three groups, a self-organized group of women in La Paz, a coop in Santa Cruz, and a nonprofit on Lake Titicaca. Their themes include fishing, gathering food and fuel and tending animals. The women usually work from home. The La Paz and Santa Cruz women purchase mill ends and scraps for their materials. The Lake Titicaca women spin their own thread, use traditional, natural dyestuffs, weave their fabric and then piece the work. Our vibrant, wallhangings from South Africa are made by Shangaan artisans, participating in an economic development project in Limpopo Province. The project, started 18 years ago by a handful of artisans, now provides employment for 1,000 people in rural areas. The Syrian embroidery is produced by a cooperative of women from remote villages. The coop provides training in textiles arts and management, provides work and builds women’s self-esteem by increasing their education and earning power. All of these groups have set prices for their products. Crossroads Trade pays in full for the products before taking delivery, so that the women do not have to wait for their earnings.